Have more than one child? We do! Naptimes are a struggle as we have to manage the different ages and activity levels of our preschooler/elementary aged kiddos with the *need* for a naptime for our tots. This “struggle” has led me to collect our favorite “calming” or “quiet time” activities. These are great for when you want your kids to wind down before bed, or if they need a break after being hyped up, or if you need them to be quiet as a baby is sleeping nearby. 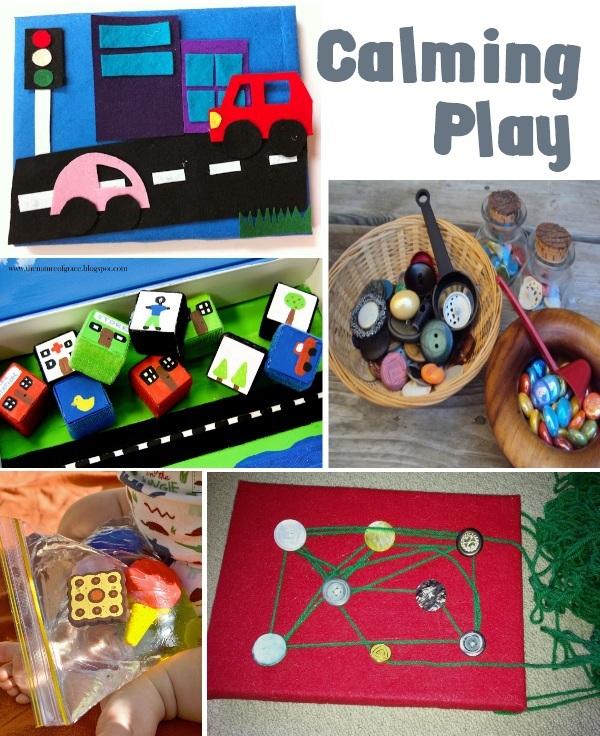 Serenity You made mini-sensory boards for her kids to explore different textures with. I can totally see my kiddos categorizing them! Toddler Approved created a colorful tower out of sponges! Now that is some quiet play – all the fun of building with none of the noise of “crashing”. These sponges work great! Kristina made a Lego Instruction Book for her kids to mimic the lego “creations” – sorta like an interactive puzzle! Paint on the Ceiling entertains her tots when they are restless with a “treasure basket“. This is a great way to encourage independent, open-ended play. Working on fine motor skills can help soothe kids as they create patterns and focus on their “task”. Healthy Mama helped her kids with a lacing activity. Looking for something quiet that can also be transported easily? Try creating a DIY Mini-Whiteboard. If your child is older, they may enjoy the repetition and pattern making required to create friendship bracelets from a loom. Here’s a great kit to get you started. Playing with felt is a great quiet time activity. Just for Daisy created a DIY Felt Board that is a perfect gift to make for a kiddo in your life. Another quiet pretend activity is creating stories. Nature of Grace created story cubes with velcro to use in her felt-lined box. Collections of different items and textures in baskets can help keep your kiddos busy – and quiet. Thanks Happy Hooligans. Create a sensory bottle to help your kids calm down. They can count the stars! I love this idea and would like to adapt it with hair gel or something less “wet” and seal the bag shut – but I can totally see a sensory water bag as a calming activity for tots! Rock-a-Bye-Butterfly had a great idea, she created a button board for her daughters to use in quiet time. She had scraps of felt that she made into shapes to “button” onto the board and I know my kids would have a blast creating “mazes” with yarn. Previous Post: « Half off Einstein Bros. Bagels! So many great ideas! My older daughter has a hard time calming down before nap. We will have to give a few of these ideas a try! Holy Moly, It’s Playtime is filling up quickly this week! Thanks so much for featuring our busy baskets! They’re still a favourite here! Thank you for featuring our lacing activity! It’s either my computer or your linky :I can’t add more activities right now for some reason! Will try later. Great listing and good timing! With Screen Free Week coming up next week, people might be looking for ideas for that video/tv quiet time tat often precedes a nap. These are all great ideas! my kids could benefit as well as us from it. This is a great resource! I found you through pinterest. Thanks! 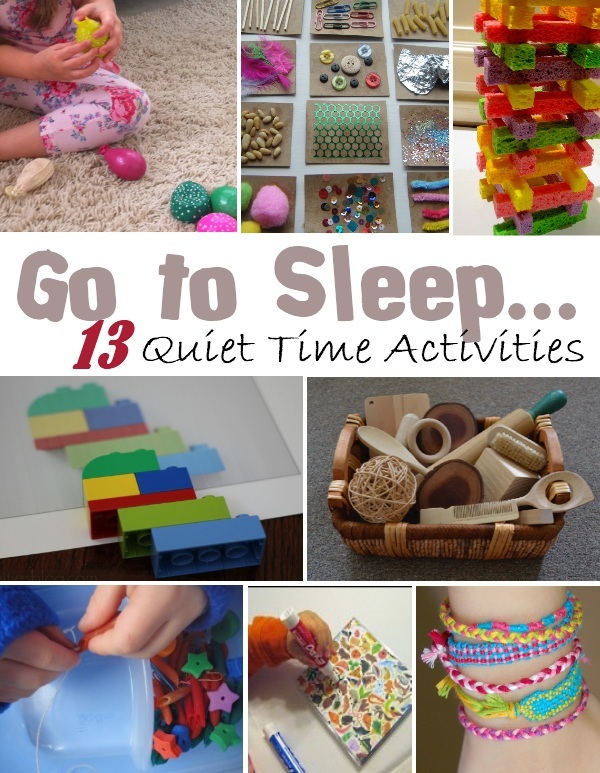 Fab list of quiet activities – will be so useful at our house! I thought I’d add my two cents. Why not. Add to this list bedtime stories. I found a free podcast off original short stories for kids at http://www.twirlygirlshop.com/stories-for-kids. My daughter loved it, and it didn’t cost me a nickel!